Hey Lovelies, Welcome to my blog. 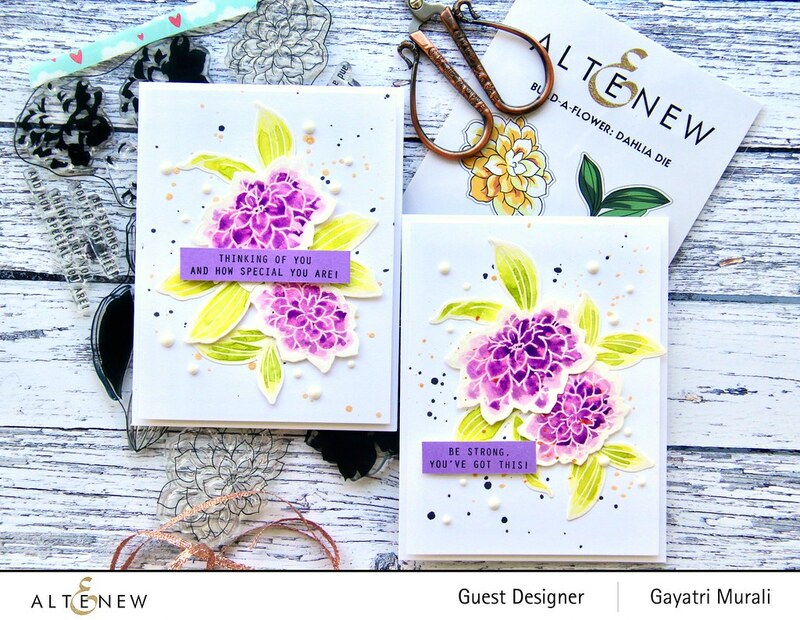 Today I am excited to be part of Altenew’s new Build a Flower Dahlia stamp set and coordinating die blog hop. If you have come from Joni Andaya’s blog, then you are on the right track. If not do not worry, I will list all the designers participating in the blog hop later in the post. 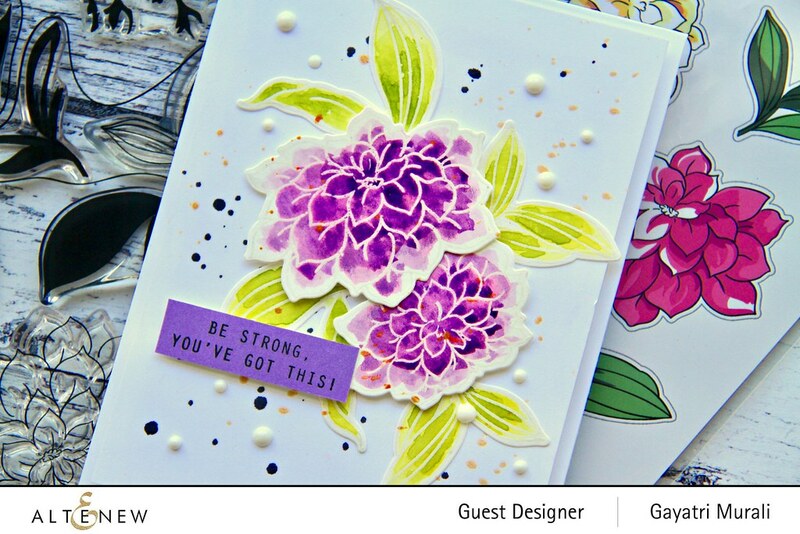 Well, here is the Build a Flower Dahlia stamp set and coordinating die. 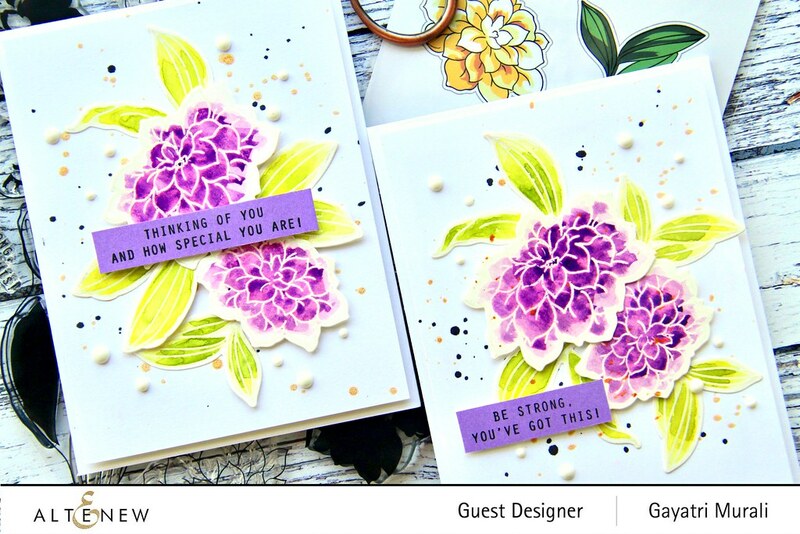 I have not one but three cards using this new Dahlia stamp set and coordinating die. Here is the first card. This card uses a lot of masking and stamping technique to create the background which looks like a 6×6 background stamp is used to make it. I have a video tutorial showing you how I made it. Also there was a little mistake I made while making this card and you will see how I fixed it. Here are more photos of the card. Next I have a set of cards using just the outline image of the flowers and leaves. I watercoloured the white heat embossed outline images of Dahlia and leaves from the stamp set using Altenew’s watercolor pan set. Then I used the coordinating dies to die cut them out. On couple white panels, I spattered some black and gold metallic Altenew spray to add interest and texture. Then I clustered glued the Dahlia flowers and leaves to form two clusters and adhered using foam adhesives on the centre of the panel. 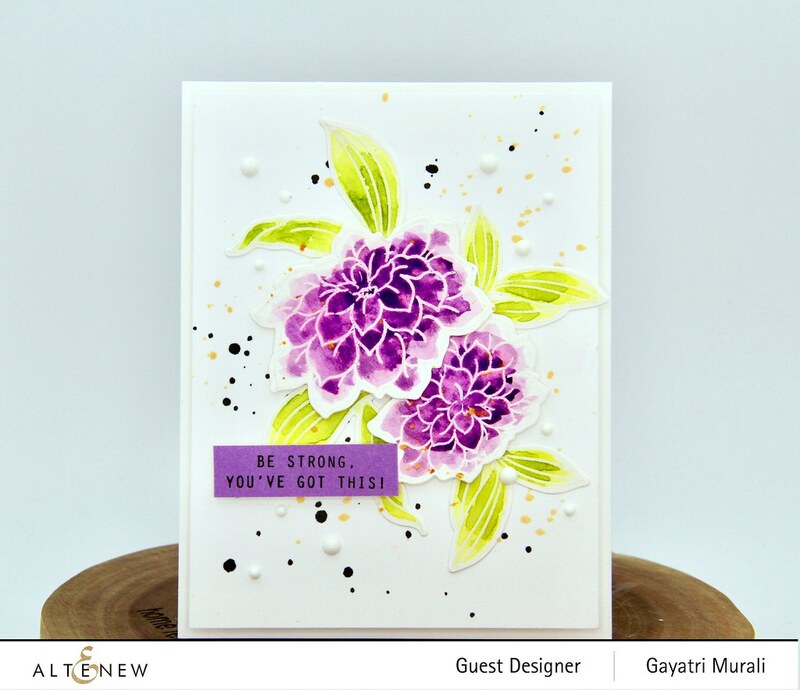 The sentiment from the stamp set is stamped in Altenew Crisp Black ink on a strip of Hydrangea ink sponged cardstock to coordinating with the flowers. I adhered the both the panels to the white card bases using craft foam. Then a few white Nuvo glossy drops to finish off the cards. Here are the photos of the cards separately. Details of the blog hop. 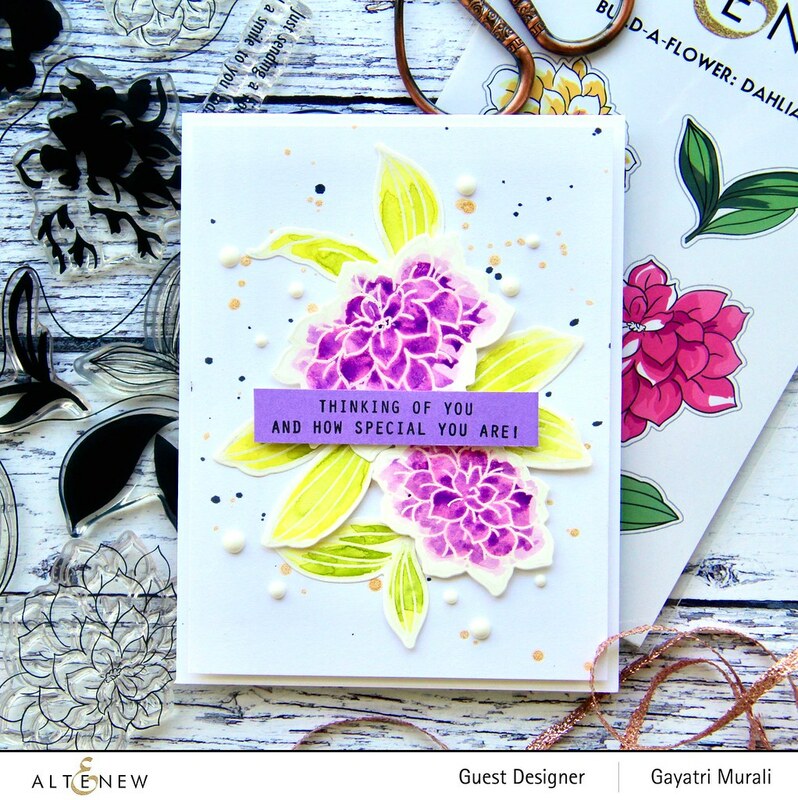 Altenew is celebrating the Build A Flower Dahlia stamp set and die release with a giveaway. Altenew is giving away a $30 gift certificate to 6 lucky winners! Please leave a comment on the Altenew Card Blog and/or Altenew Scrapbook Blog for a chance to win. Three winners will be announced on the Card Blog, and the other three winners will be announced on the Scrapbook Blog on 3/9/2019. I too have a giveaway on my blog. One random lucky winner receives $20 Altenew gift certificate. So please leave a comment below to enter a chance to win. I will announce the winner on March 6th 2019. Here are the list of designers participating in the blog hop today. Make sure you visit everyone and leave them some love. Thank you very much for taking the time to visit my blog post. Have a lovely weekend! That is a lot of masking effort that resulted in a beautiful card. You have massive patience. Why didn’t you use the dies to make the masks? Gorgeous creations, thanks for sharing! I love the lovely colored flowers especially! I love both cards! Your monochromatic one is so unique and beautiful. I like both of your cards. But your first one is my favorite. It is so different from what anyone else on the blog hop did with this beautiful stamp set. That one is so unique and I love it!! Thanks for sharing. Thanks for the idea of using the flowers to make a background and especially how you fixed the darker color you weren’t happy with. I’m going to remember that. This first card is absolutely gorgeous. Thanks for the great video. I also love the second card. It is so bright and beautiful! Your very different designs say a lot about your versatility! Beautiful! Love the first card, great set to create a stunning background.Thanks for sharing the ideas and tips. Pretty card. I really like the fresh green colour scheme. Your clever way to hide the area you didn’t like is perfect. The monochrome green card with all the masking is an absolute masterpiece! Both of these cards are unique and beautiful. The masking took time, but it’s so worth it. Love the simple color palette you used! Your second card is very nice but the green card you made first is so stunning. I am glad you didn’t use the darker green on the leaves. It would have ruined perfection. I found your first card to be so striking! I loved them all…but that was my favorite! Thanks for sharing the process via your video. I love how you used the stamp set to make the background. I love making my own backgrounds si seeing yours has inspired me! Both are stunning! But I really like that unique monochrome light green! Both cards are beautiful. The first one reminds me of a coloring page. Both beautiful, but the tone-on-tone green really makes my heart sing! Your card designs are fabulous! Both of your cards are beautiful but I’m in love with the green one. Just using one layer for the flowers and just the outline for the leaves was perfect. You put so much effort into that card but the result is amazing. Thanks for sharing and for the great video showing us your process! Absolutely gorgeous set! 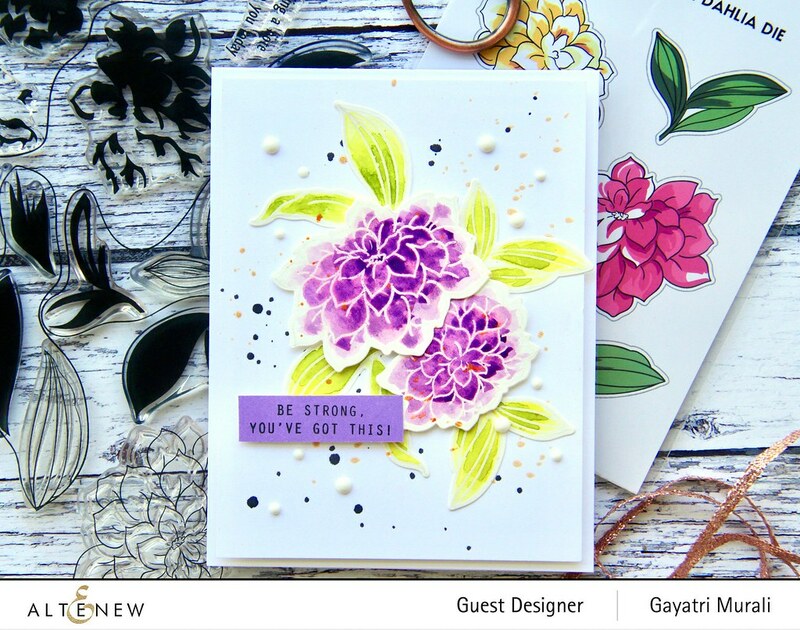 Love your cards Gayatri especially the pretty card set!! Thanks for the inspiration! So beautiful! I cannot wait to receive this stamp set! Great idea, thinking out of the box! I love what you created with this stamp/die set. It sure makes me want to go out and purchase more stamp/die sets! One of my favorite flowers! Love this! Great techniques! Oh, you must have so much patience. Your first card is outstanding!! Thank you for taking the time to make a video of the process. I do love your other two as well as I am a person who loves watercolour above all other mediums. Thanks so much! Both cards are stunning. Love the stamping on the first card making it look like a background stamp. Don’t think I have the patience for that technique. Thank you for sharing your inspiration. Oooh’s and aaah’s here for another beautiful flower. Love your card inspiration – especially that first Card. It’s so unique and beautiful! 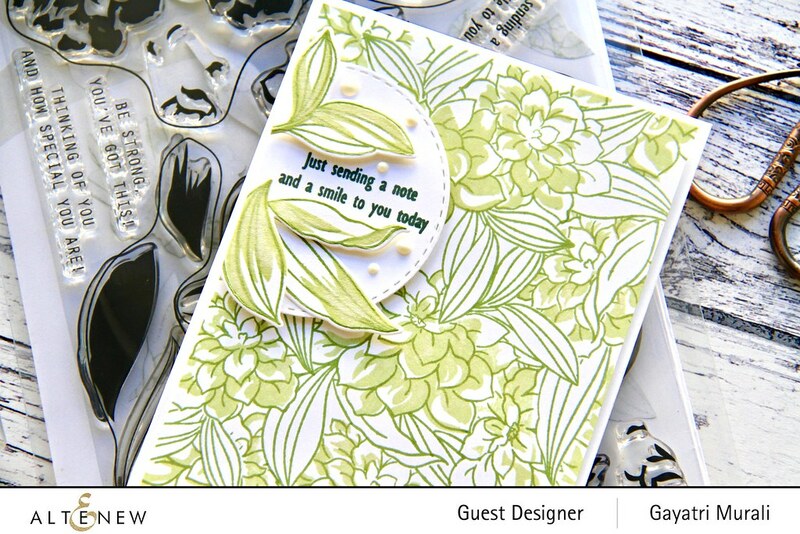 Two beautiful card ideas and two different approaches to using this stamp. Thanks for the inspiration! Oh the purple has my attention ! WOW! WOW! really inspired by your first card and all in a colored ink! great designs!!! Lovely cards! The first card, especially, is so fresh and pretty, making me think of Spring. Wow! Absolutely gorgeous cards! Stunning and creative designs. I have to say that your first card has captured my heart – simply WOW! Thanks for leaving your mistake in the video and showing us a way to still use the design you worked so hard on. It helps to know designer make mistakes too. Your dahlia background is gorgeous and the card was stunning in the end. Thanks for sharing your time and talent with us. All three cards are gorgeous, but the first one is stunning. I love how the leaves frame the sentiment. Thanks for sharing your talent. Your card designs are stunning! 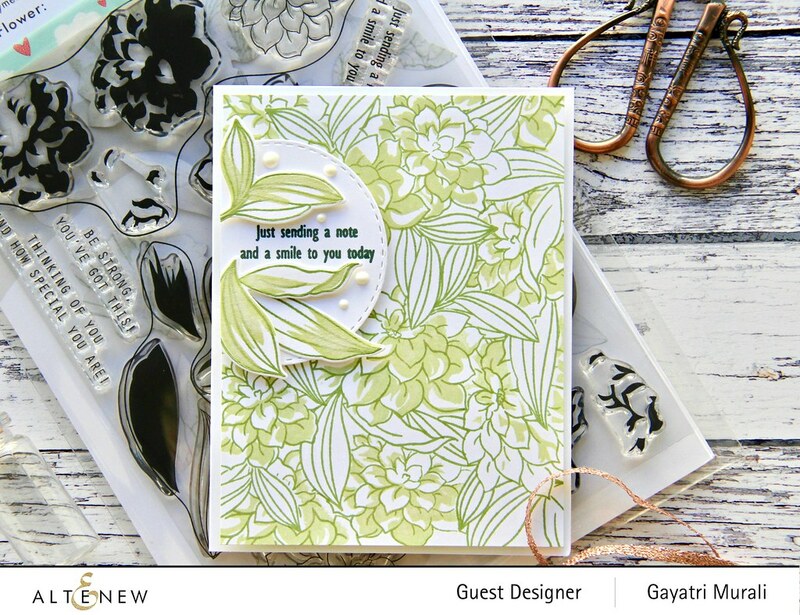 your masked background card is simply gorgeous, Gayatri – always love your cards and this new BAF is wonderful!! simply stunning! Thank you for the inspiration on using this build a flower set! Beautiful cards. I especially like the first one. But oh my, the masking! I have done a little and can’t imagine doing as much as you did for this card. I love your green card! It was worth all the work you put in it to make it! Gorgeous, unique cards. I love the first one and the brilliant colors on the other are stunning. Both of your cards are beautiful! That first one is way too much masking for me but the outcome is really beautiful! Thanks for the inspiration! Both cards are very pretty! I especially love the soft look of that first card! I love the carpet of dahlias you’ve created for your first card, and the beautiful watercolour of the others. Awesome cards with such pretty colors! The dahlia flowers are just beautiful! Great new BAF set! fabulous cards Gayatri. 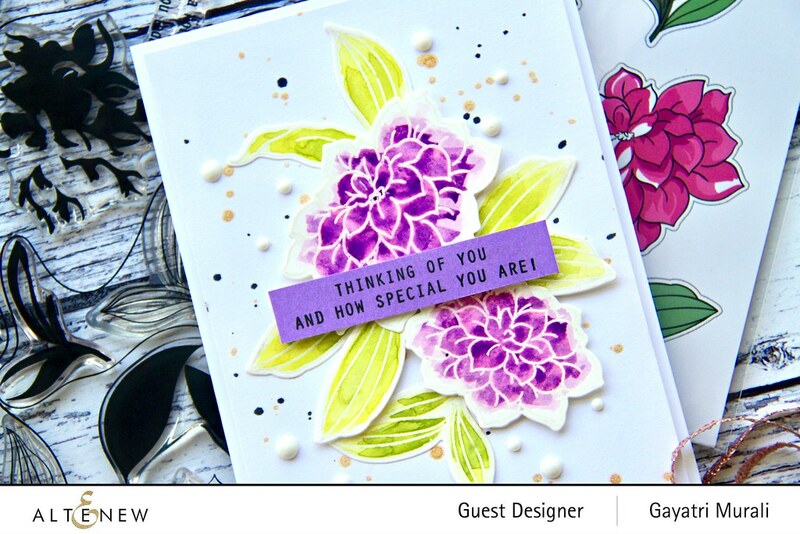 Love the monochromatic look to your first card and great save! If you hadn’t shown it on the video, I would never have guessed that the design wasn’t supposed to be what it was. I can’t decide which is my favorite but I think I love the monochromatic green. That’s just so unique and gorgeous. TFS! Fabulous cards!! I think the second is my favorite, I love purple. The flowers are gorgeous!! Girl, that purple is awesome! Your cards are lovely. I really like that first one. It is gorgeous. Very lovely cards. The greens in the first card look so fresh and bright! Your watercoloring in the other two cards is beautiful. Thanks for the inspiration. Your cards are really lovely! 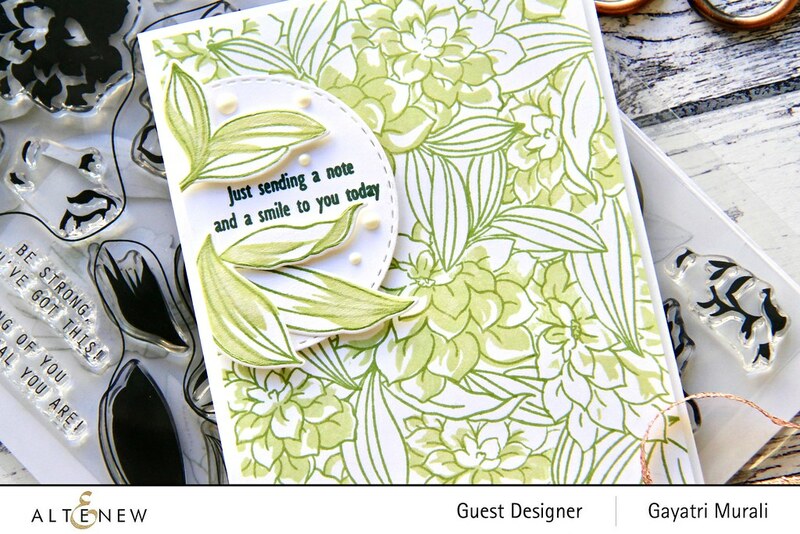 The green is so refreshing and unexpected and the watercolor card has such wonderful color and detail! Thanks so much for sharing! Wow! These are so beautiful, Gayatri! Gorgeous projects. Colors are very nice and clever use of the backgrounds. Your cards are stunning. Your stamping is totally amazing. I love watching your process, which makes understanding how this gorgeous card comes together so much better! Thanks for sharing your beautiful work with us.